Food Records asked for something ‘barbaric’, and design studio Stylorouge duly delivered. The jittery, jumping Jesus Jones logo is still going strong almost 30 years later. Transport yourself back to the late-1980s, if you will. The divisive Mrs Thatcher was coming to the end of her second term as prime minister. The New Romantics had packed away their ruffs and mascara. Bowie was tinkering with Tin Machine. Baggy Ts and outsize white hi-top trainers were de rigueur. The British dance-rock scene was in full swing, championed by bands like Pop Will Eat Itself, The Shamen, The Wonder Stuff and Jesus Jones. As it happened, Jesus Jones had recently signed to Food Records (later to hit pay dirt with Blur), who had an ongoing relationship with the prolific, terrific design studio Stylorogue. 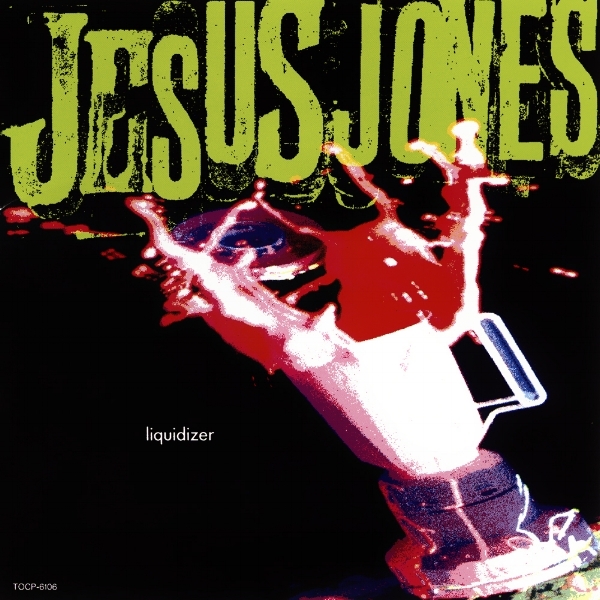 Mash it up: ‘Liquidizer’ (1989) brought Jesus Jones their first taste of success. Rob O’Connor describes the cover artwork as “literal, but energetic’. Can’t argue. What the devil? Originally titled ‘?’, ‘Doubt’ (1991) was easily the band’s most successful outing. The creepy looking imp was designed by Stylorouge’s David Calderly (now running Graphic Therapy in New York). Known as ‘The Demon of Doubt’, it became almost a secondary logo, and was used widely on T-shirts and other merch. Lucha Loco: ‘Perverse’ (1993) featured an in-your-face, photocopied image of a masked Mexican wrestler. It was the distillation of an elaborate, staged photoshoot for the album packaging; a curious, voyeuristic tableau, in which more of the story is revealed as the viewpoint recedes. Though the Jesus Jones logo was an artful mash-up of Victorian and Edwardian playbill letters, Stylorouge usually reproduced it in vivid, day-glo colours to give it a punchy, contemporary twist. Stuttery, jumpy, mismatched, misprinted, and running at an upward angle, it still has a compelling sense of attack and movement. The logo went on to be used on nearly all Jesus Jones’ singles and albums, alongside a wide variety of artwork — from illustration, to still life, to classic band shots. It not only lent a graphic coherence to this extremely diverse collection of imagery, but contributed its own inimitable character and slant. A dimension too far? Hmmm, see what you mean Rob. Jesus Jones are back touring their new album, ‘Passages’. They are still using the logo. Stylorouge is 36 years young. It was originally formed in 1981, when Rob O’Connor left his job in the art department at Polydor Records to go solo. Since then, the studio has produced a massive body of work for the likes of Blur, Pink Floyd, Squeeze, Morrissey and Jake Bugg. You can still get hold of the book ‘Delicious: The Design and Art Direction of Stylorouge’ (Written and co-edited by me and Rob) here. Many thanks to Rob for his time and memories.